It’s been over 6 years since Google first announced that they would be looking at page loading speed as a website ranking factor. As a result, content delivery networks (CDNs) have grown to become an essential tool in speeding up websites – no matter how big or small. In this post, we’ll look at how using a CDN can enhance page loading speeds, improve SEO rankings and generate more website enquiries. A CDN is a network of proxy servers that work to improve the speed of how content is delivered to a website user. The content being served may include anything from images, videos, audio files or documents. A CDN will help improve website loading times by serving requested files through the closest proxy server to the end-user. By having content served from the nearest server, this reduces the need for the browser to pull content hosted half way across the world. Say for example you’re doing some online shopping from your office in Sydney. You’re looking to purchase a new pair of Nikes from your favourite shoe store who happens to be located in the US. What will happen is, once you’ve logged onto the website, you will be served content pulled all the way from the US. No dramas right? Well, this is where it gets interesting. Instead of your browser reaching out and requesting files hosted from the US, wouldn’t it be faster for you to load a page if the website was hosted in Sydney? (keeping in mind that you’re browsing from Sydney). Because of the proximity between your location and the website’s server, this allows your browser to download and load web pages at a much faster rate. This is what CDNs are here to do. They serve web pages FAST. They do this by serving content on their servers which are located nearest to the user’s location. As we covered above, when using a CDN, website files are hosted on multiple data centres across the globe. Instead of users loading web files solely through the main server location, the website is served through the closest networking centre – effectively reducing response times. Fast page loading times means a higher chance of achieving higher rankings on Google. Website users are typically known to leave websites that take longer than two seconds to load. Keeping this thought in mind, it’s mind-blowing to think that massive online retailers such as ASOS or The Iconic could potentially be missing out on thousands of dollars per year due to visitors leaving as a result of slow loading speeds. Page loading speed applies individually to both desktop and mobile devices as different viewports will render/load the same page differently. If you think your website is suffering from slow loading speeds, I would highly encourage you to take a few minutes and run your site through either GTmetrix or Pingdom Tools. This will allow you to see exactly how long it is taking your website to load for the average user. Both speed testing tools allow testing from Sydney/Melbourne, which is great for testing the speed of Australian websites. If you’ve run your website through the speed testing tools above and have received a higher score than 4-5 seconds, feel free to contact us. We’ll run through a more comprehensive speed audit and come up with a plan of action. Users are known to trust websites that load faster. Psychologically, I think it’s reasonable to think that a slow loading website must be unreliable. And when your whole business is based online, having customers think your service or product is unreliable is a massive deal breaker. Below is a graph that correlates the conversion rate of sales made to the number of seconds it takes for a website to load. The graph is based on a real-life mobile case study conducted by SOASTA on one of their leading online retail clients. 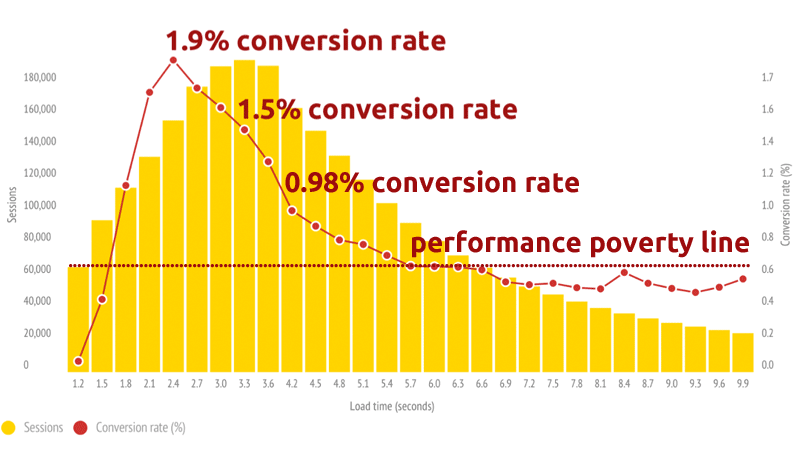 In a nutshell, the graph shows that the online retailer achieved the highest conversion rate when the website was loading from 2.1 to 2.7 seconds. Any higher than 3.3 seconds and conversions would start to see a slump. There are both free and paid CDNs available. Most free CDNs will come with various restrictions and limitations, whereas paid CDNs will offer different types of pricing plans. Below are 3 of the most popular CDNs available for small to medium-sized business websites. CloudFlare (Free & Paid): CloudFlare allows for both a free or paid service and is considered to be one of the best free CDNs available on the market today. With extra features such as website caching, WordPress integration and security functions, this network would be perfect for small-medium businesses looking for a free and reliable CDN service. MaxCDN (Paid): One of the most popular CDN services up to date. MaxCDN offers many different pricing options and has a 30-day money back guarantee. Their prices are possibly the lowest on the CDN market, making them extremely affordable for businesses who have low amounts of traffic but are serious about improving their website speed. Amazon CloudFront (Paid): Amazon CloudFront is a CDN service offered by Amazon, the world’s largest online retailer. Their CDN service has been around for years and is offered through a pay as you go pricing plan. This may work out better in favour for websites who have very varied traffic figures on a day to day basis. You pay for the bandwidth you use and not a cent more. Before purchasing or implementing a CDN, I highly recommend you conduct a page analysis through Google’s PageSpeed tool. Simply following the Page Tool link, insert your URL in the box and hit analysis. Record the score and original site speed and then implement your chosen CDN to test new improvements. Many speed optimisation tweaks were implemented on the Big Vision Marketing website (https://www.bigvisionmarketing.com.au), before and after launch. We tested both CloudFlare and MaxCDN on our own website and various others, from small business websites to larger eCommerce stores. In conclusion, we found that for larger websites that were image heavy, a CDN would have an immense impact and improve the serving of large files quickly. Online eCommerce stores would benefit from MaxCDN’s functionalities as eCommerce websites are typically populated with both small and large scale products images. On the other hand, smaller business websites would benefit from CloudFlare’s free services. The caching, security and always online features were enough to warrant a setup within itself. Because you’re not hosting large content files, a good caching system along with an updated and optimised website would ensure lightning fast loading speeds. Don’t let slow loading pages affect your website’s rankings and sales. Contact us today for a free website audit.